In the latest versions of Storwize and SVC it is required to use a "superuser" account in order to perform the "svcconfig backup" command. using any other accounts raises an error "CMMVC6202E This command can only be run by the superuser". To avoid this, please make sure the a "superuser" account is used by the Probe. This section explains how to set up the Storwize probe, to collect data from your system. You will need to reference each of your systems, and attach a private key, if they validate you can then start their data collection. Click the "Add new..." button in the "Storwize Systems" section. 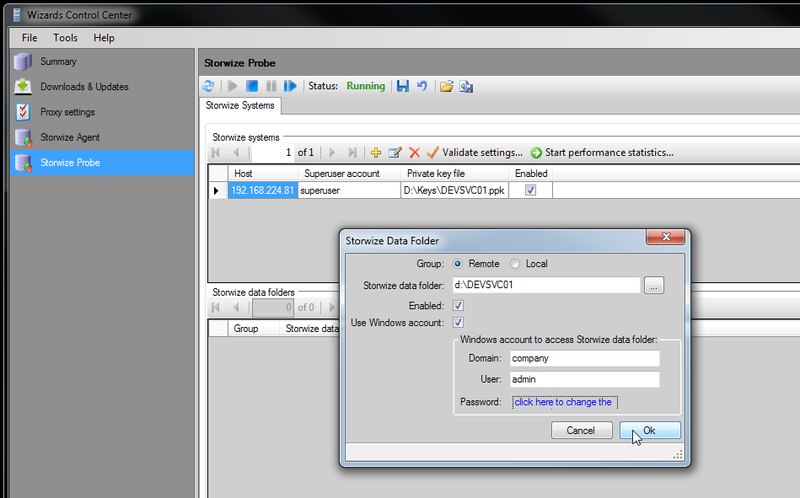 Fill in the "Storwize System" form with your Cluster info and the private key you just created, then click "OK"
Next, click the "Add new..." button in the Data Folder section. The group selection should always be "remote", unless otherwise instructed by Debriefing Software support. 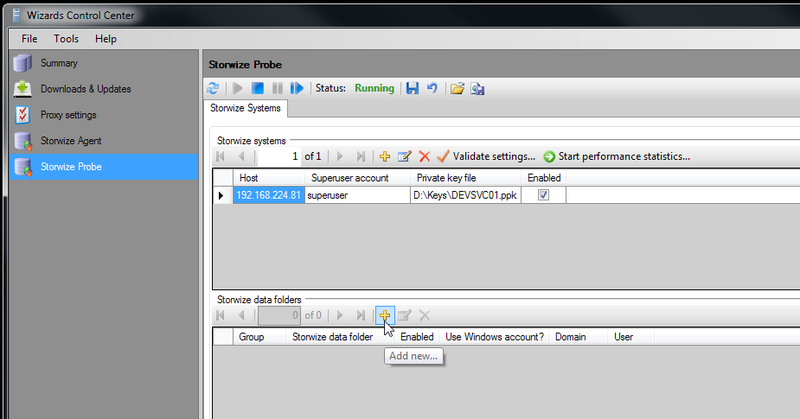 After entering the directory for the Probe, click the "Validate Settings" button to test the connection to the entered Cluster. Repeat the steps above for each available Cluster. Now we configure collection of statistics for each Cluster. Mark each configured cluster, one at a time, and click the "Start Performance Statistics..." button. The final step is to save the settings/changes and start the Storwize System Probe. This completes the configuration of the Storwize System Probe.